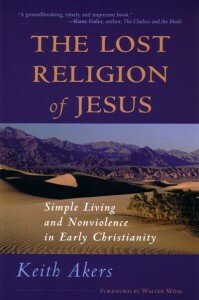 Jesus’ preaching was first and foremost about simple living and nonviolence; he never intended to create a new religion separate from Judaism. Moreover, Jesus’ radical Jewish ethics, not a new theology, distinguished the followers of Jesus from other Jews. It was the earliest followers of Jesus, the Jewish Christians, who understood Jesus better than any of the gentile Christian groups. In this detailed and accessible study, Keith Akers uncovers the history of Jewish Christianity from its origins in the Essenes and John the Baptist, through Jesus, until its disappearance into Islamic mysticism. Akers argues that only by really understanding this mysterious and much misunderstood strand of early Christianity can we get to the heart of the radical message of Jesus of Nazareth. Other scholars have explored this field, and several significant studies have been published, but none of them have the impact this one has. . . . Akers presents nothing less than an entire recasting of Christian origins, as well as a whole new conception of Christianity. A groundbreaking, timely, and important book. Keith Akers has written an important, timely book that sets the historic record straight.